The rhythmic pulsing of the helicopter blades above you gets your heart pounding as it carries you over a glittering field of ice. 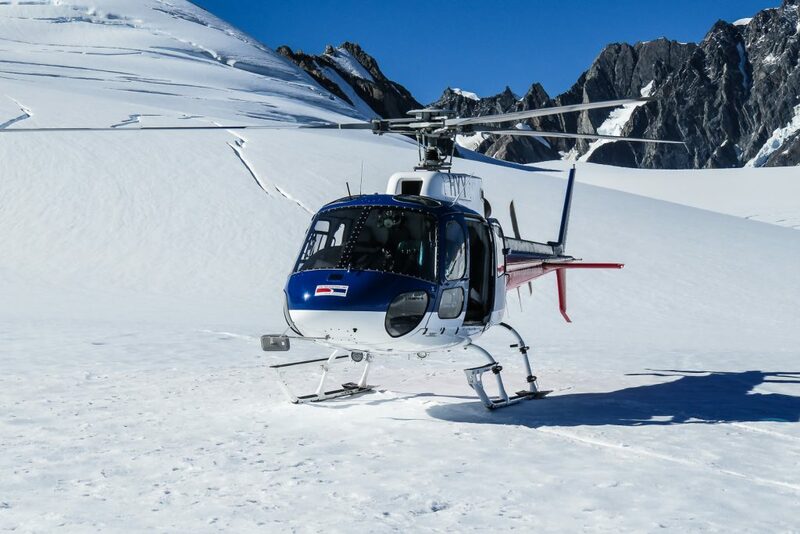 The helicopter begins its descent over these New Zealand Glaciers and you are moments away from taking your first tentative steps out onto the glacier. Looking around, your eyes begin to widen with wonder as you consume this jaw-dropping view; Dark rocks pierce the white veil of snow and ice, uncovering the hidden mountain beneath. New Zealand’s South Island is adorned with a number of beautiful sights, but few match up to the magnificence of the Fox Glacier and Franz Josef Glacier that lie near the western shoreline. 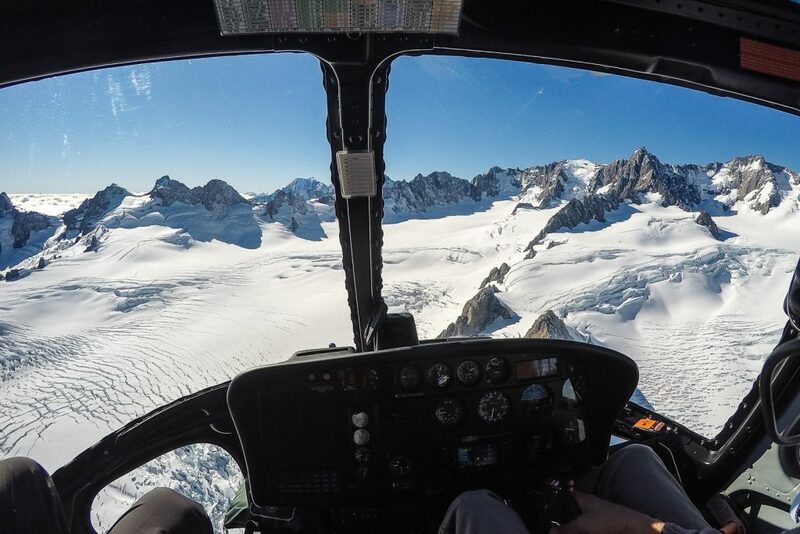 There is truly no better way to experience these glaciers than through the window of a helicopter. 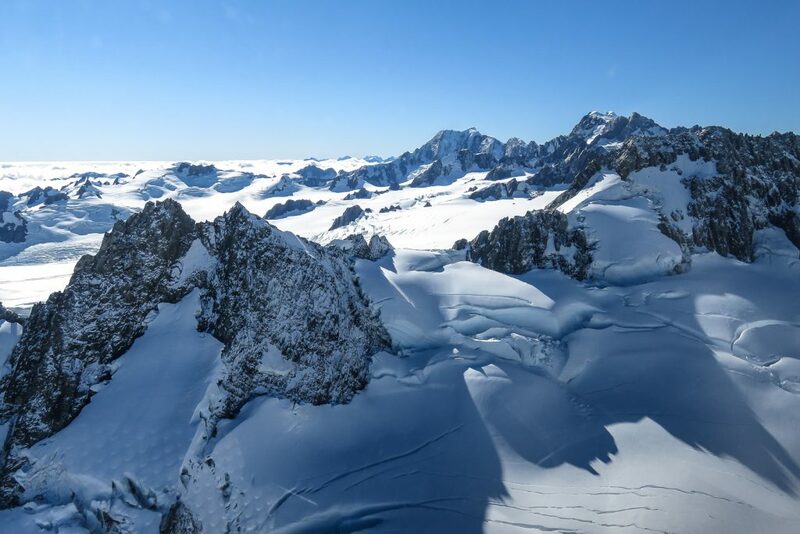 You can book a tour in the town of Franz Josef to add to your New Zealand South Island Itinerary. Once the flight has been booked and you’re ready to embark, you will be picked up at the local helipad and flown south to Fox Glacier. Within minutes you will be able to see the lush ridges of the mountain’s lower foothills. The small gullies and ravines cutting into the green landscape almost like the folds of a blanket. As quickly as the green hills come into view, they disappear as the low-lying clouds swallow you whole. After a short moment of mist surrounding you, the clouds will dissipate and you will emerge to ridges of sparkling white snow, and not the rolling green hills of below. The dark blue skies set a clean backdrop for the mountain peaks that rise from the snowy hills. You will have a clear view of Mount Cook and Mount Tasman, New Zealand’s two tallest peaks. 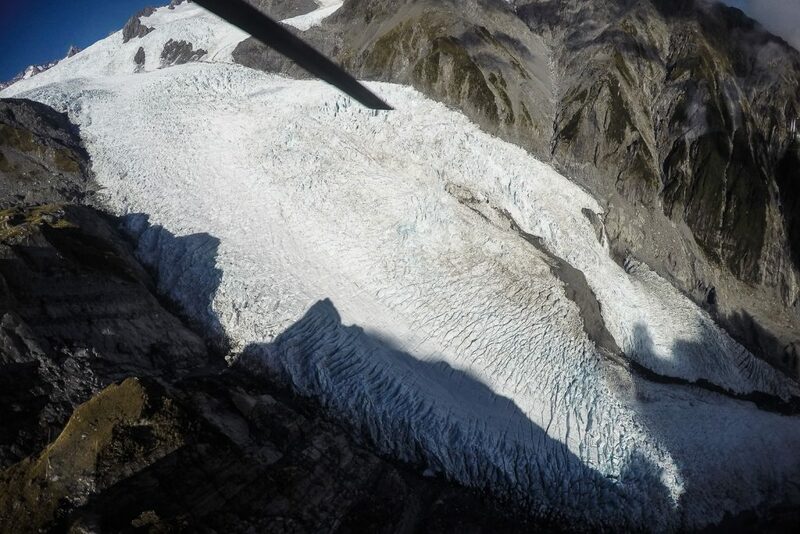 As the helicopter brings you closer to the mountains, you will be able to see the Fox Glacier beneath you. 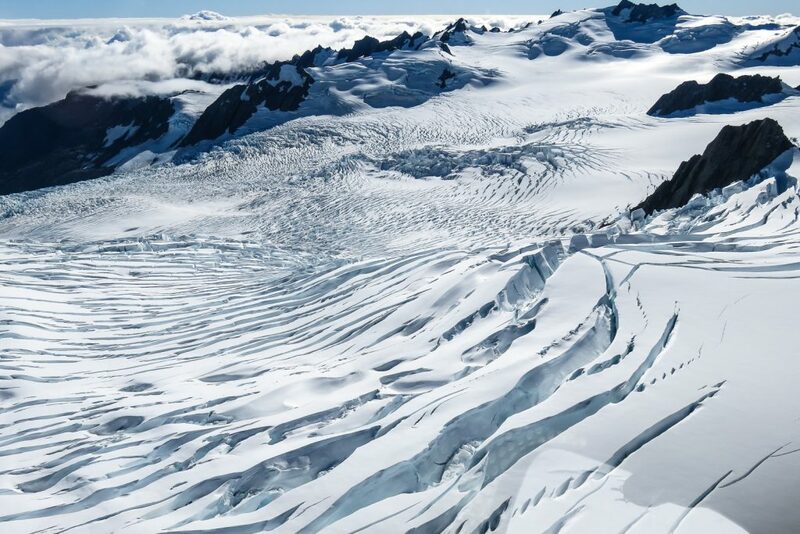 This will mark your first real view of these phenomenal glaciers. 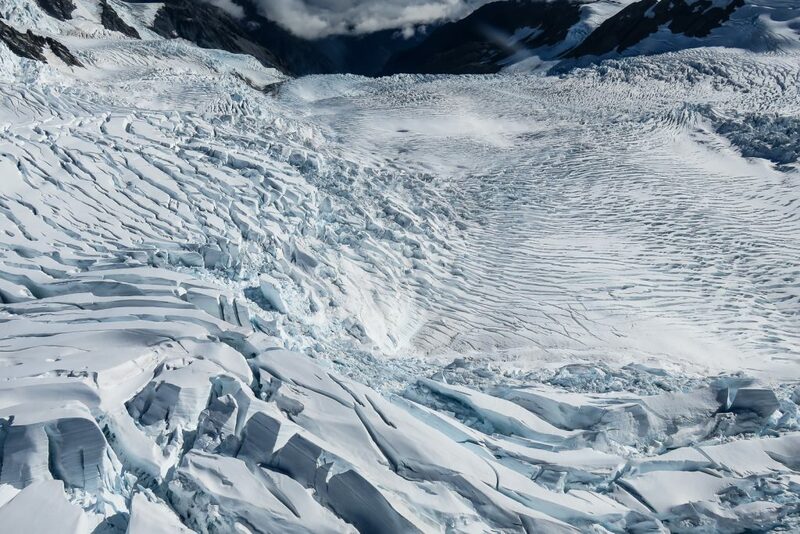 This excellent bird’s-eye view of Fox Glacier New Zealand shows that it is essentially a river of ice. As you gradually begin to descend, you will see the that the glacier is carving through the rock. Biting into the mountain, the glacier causes rock-falls which cascade and tumble onto the ice. You will notice that the glacier has a rich, turquoise undertone to it that seems to glow through the white exterior. The ice appears blue because of its purity. Since it doesn’t have any air bubbles in it and is far denser than the snow on the mountains, it’s able to absorb more light at the red end of the spectrum than the blue, allowing the ice to reflect this turquoise colour. Fox Glacier spans a total distance of 13kms and is fed by two alpine glaciers. It was named after the Prime Minister of New Zealand, Sir William Fox, in 1872. It becomes more and more evident to you as you hover over these spectacular mountain ranges that there is nothing quite like flight. The freeing sensation that washes over you as you feel yourself floating effortlessly above this mesmerising landscape. The world seems to be laid out in front of you and you see things around you with fresh eyes. No matter where you are in the world, the moment you lift off the ground, your perspective changes. 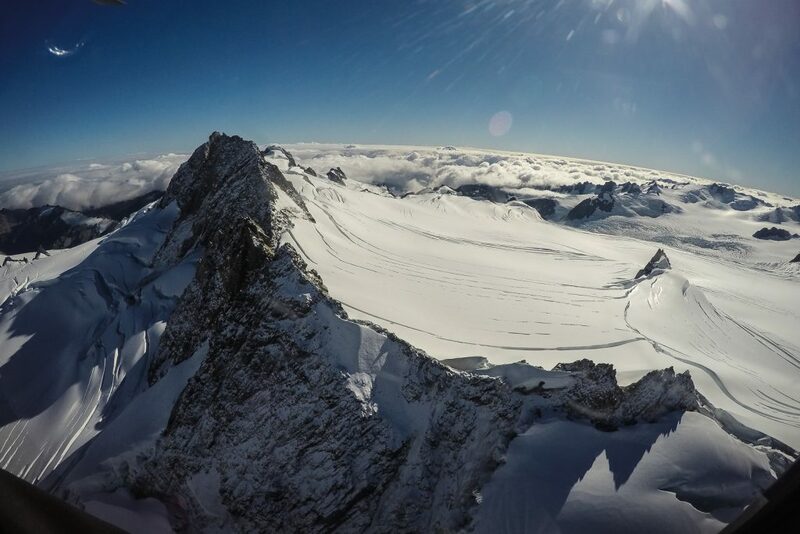 After several minutes of appreciating the beauty of flight and the marvellous scenery around you, you will climb ever higher to the alpine glacier level. It is here that you will first be able to appreciate the sheer size and depth of the crevasses that riddle Fox Glacier’s surface. From your excellent viewpoint in the sky you’ll be able to see how the glacier flows with the shape of the mountain, giving you a sense of its underlying terrain. 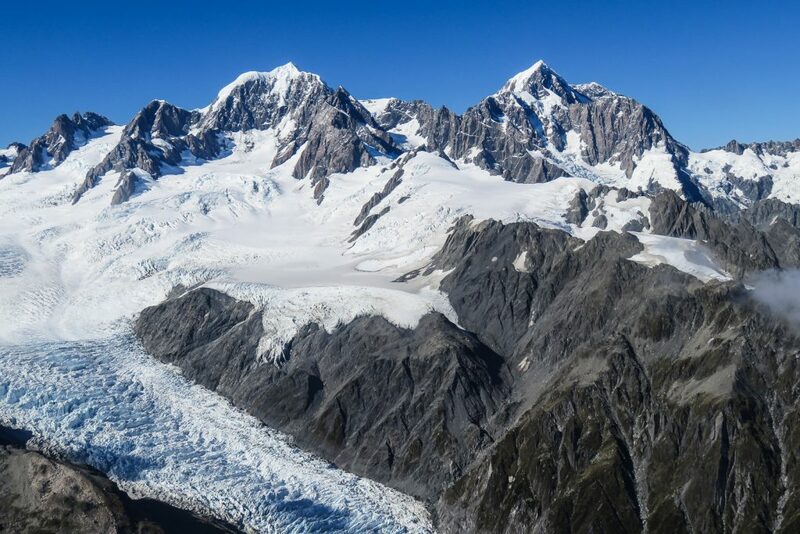 At this point, you will have a dazzling view of Mount Tasman as it towers proudly above Fox Glacier. 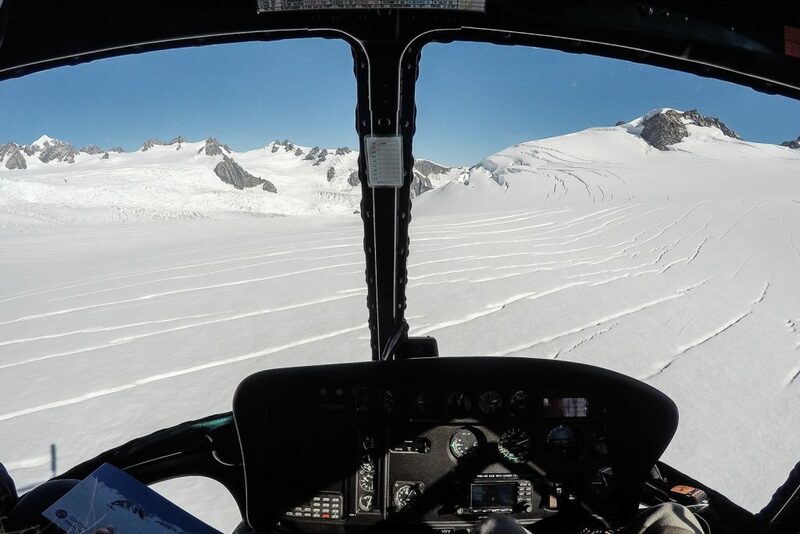 As you hover above Fox Glacier’s highest slopes, you will have a chance to look out across Gem Glacier. Pools of bright blue water sit on top of the glacier’s pure ice. Thousands of cracks break Gem Glacier’s surface, giving it a living texture. You can almost imagine the entire glacier heaving gently as it breathes in the cool, fresh air of the mountain. 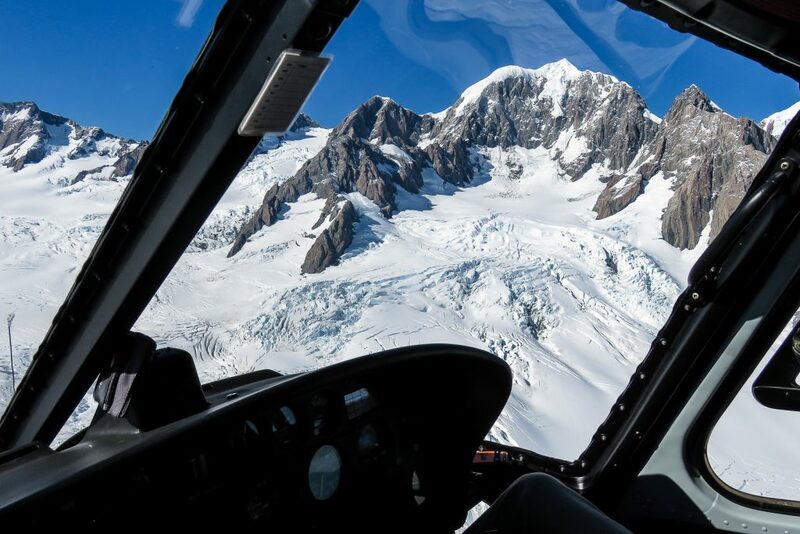 You feel the rumble of the helicopter through your seat as you gaze out the window at the glacier below. Shading your eyes from the brilliant light of the sun, you look up to see a large peak breaking through the snow. The dark, jagged rocks of the mountain protruding from the powdery slopes and you can’t seem to tear your eyes from this magnificent scene as you fly a little closer. 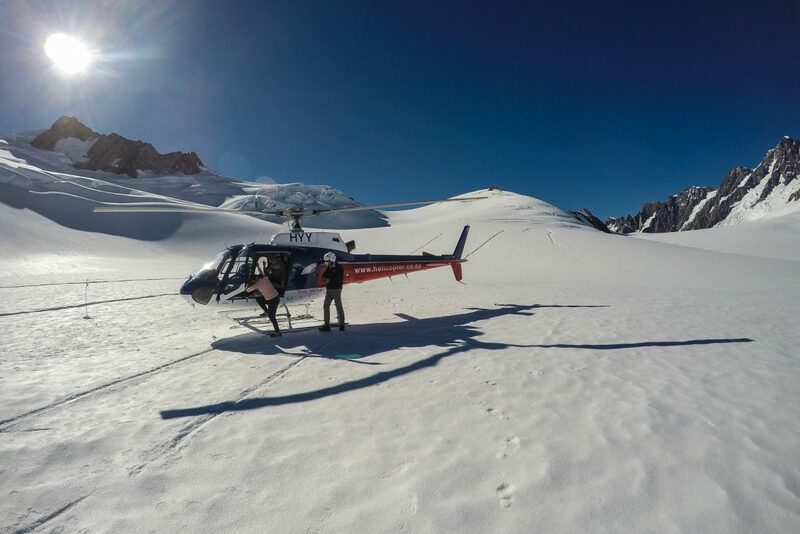 Once you have explored Fox Glacier in its entirety from the air, the helicopter will make its way to Pioneer Range. Pioneer Range is a ridge that runs between Fox Glacier and Franz Josef Glacier. It stands as a dividing line between the two glaciers and displays an impressive summit known as Triad Peak. You will find that certain parts of the glacier have a new layer of snow coating the ice underneath. This snow will remain here year-round, and will eventually become part of the glacier as it compacts under a new layer of snow. This illustrates how glaciers are formed, as layer upon layer of snow compresses to create the dense, pure ice. You feel adrenaline coursing through your veins as the helicopter crests the mountain. Your heart jumps into your throat as you begin to descend rapidly, drawing nearer to the icy crevasses below with each passing moment. At the last minute the pilot levels out and you look down to see the ice rushing past you. Crevasses are a product of friction in the ice. The immense pressure of gravity weighing down on glaciers causes them to shift. Flowing down the mountain like a tremendous river of ice. As the friction increases, so too does the stress on the ice crystals. 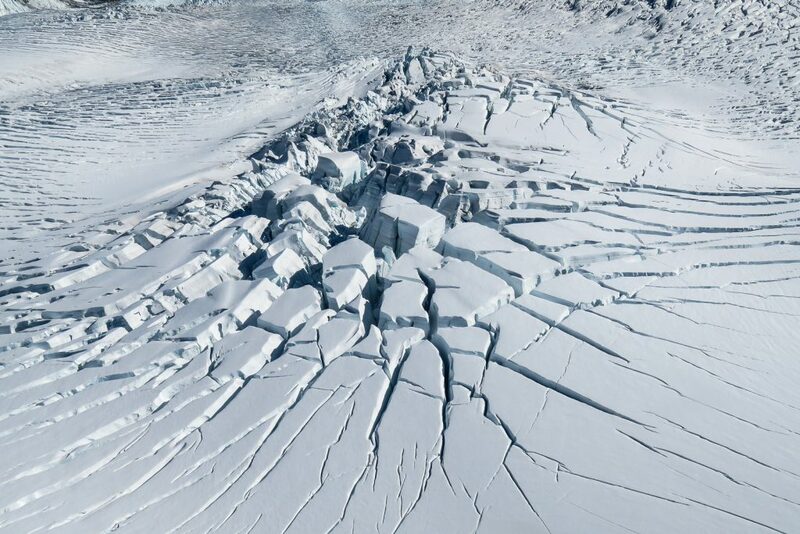 Eventually, cracks begin to form and large crevasses begin to slice through the glacier. Though the crevasses may be caused by a colossal amount of stress, the resulting imagery is simply stunning. Soaring over this incredible landscape will provide you with some truly splendid photographs. The icy wind stings your cheeks as you take your first steps out onto the vast glacier. Looking down at your feet you notice the dry, crunchy texture of the snow. Firm beneath your feet as you walk out onto this glittering expanse of ice. This is like an adventure straight out of a Hollywood blockbuster. Standing on this glacier with mountains rising up around you really makes you appreciate the incredible beauty of these glaciers. You are given a moment to stop and get lost in the pure, untainted splendour of nature. Now you can cross ‘walked on a glacier’ off your New Zealand South Island Itinerary and bucketlist. One thing that becomes very apparent as you stand on the glacier is the incredible density of the ice. You can feel the ground beneath your feet is sturdy and strong. This truly is the highlight of the trip because it gives you a sense of how the glacier is formed. Layer upon layer of snow lies below you, and over many years with the helping hand of gravity they have compressed to form solid ice. While being on the ground may offer you a panoramic view of the glacier, you aren’t able to tell the sheer size of it from where you stand. Only once you are back in the air can you truly appreciate the enormous size of the glacier. After 10 minutes, the warmth of the helicopter will beckon to you and you will be airborne once again. As you climb higher into the air, you will feel the thrill of flight consuming you once again. 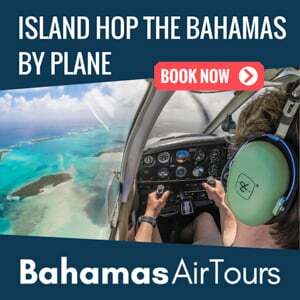 Even though the entire tour only takes a little over 30 minutes, at this point you will have a whole host of new experiences to take home with you. 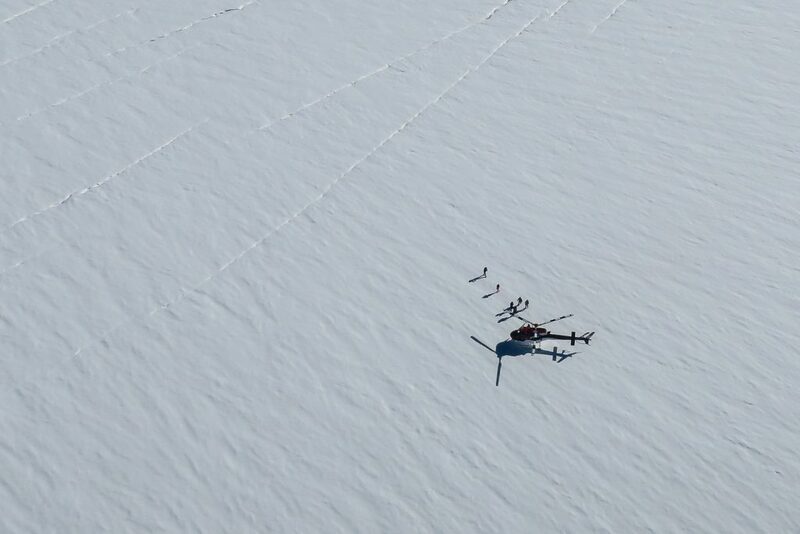 The helicopter will rise into the sky and begin to fly over the Franz Josef Glacier New Zealand. As you travel further along this glacier, on your way back to the town of Franz Josef, you will notice a sheer drop ahead of you. The glacier flows over the cliff in a spectacular waterfall of ice. You will be able to see the way in which the glacier moves, and how it has carved its way through the rugged rocks of the mountain. 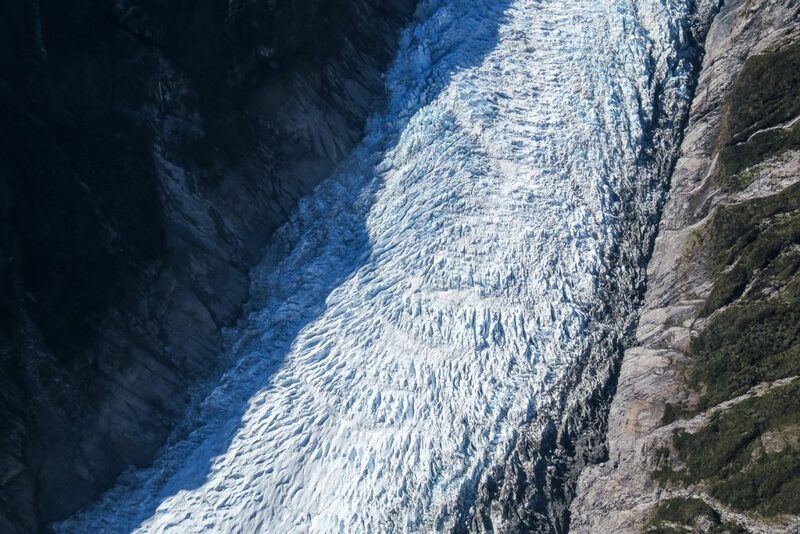 The Franz Josef Glacier is 12kms long and extends down the mountain to a point just 300m above sea level. This glacier exhibits a pattern of ‘expand and retreat’. 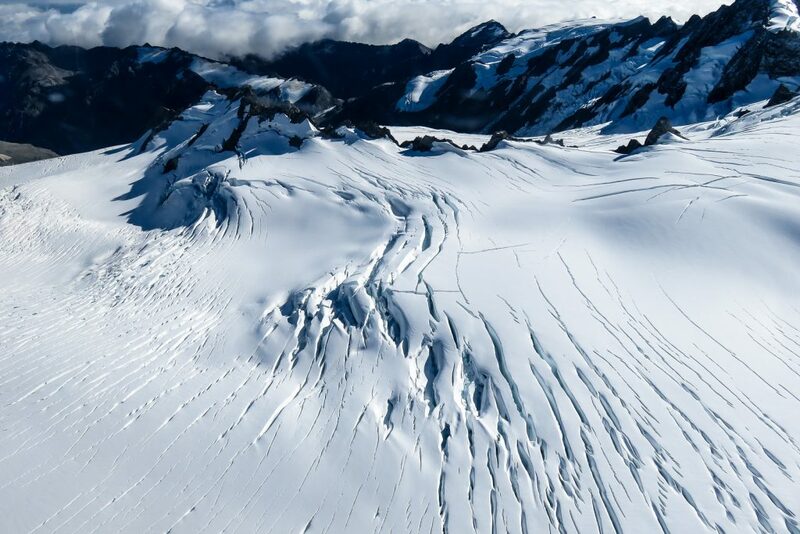 As the glacier retracts up the slope, it leaves a scar on the mountain in its wake. This is a powerful image that illustrates the very real effects of global warming. 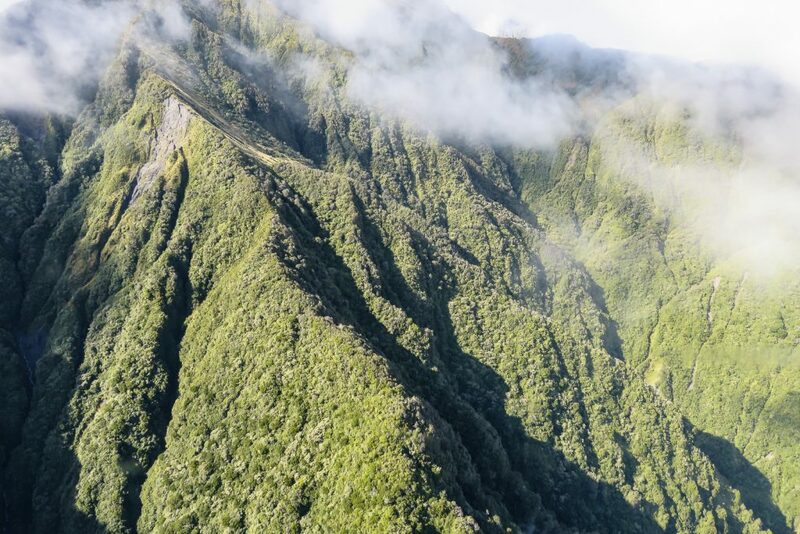 The helicopter plunges through the layer of clouds and emerges once again to the flowing green foothills of the mountain. As you come in to land at the helipad, your mind will be swirling with everything you just experienced. The trees thin out up ahead and you take your first look at the tongue of the glacier. A large wall of ice with a cracked weathered face stands before you, resplendent in the morning sunlight. The trickling sound of water from the river beside you is broken by the thundering sound of the ice cracking. 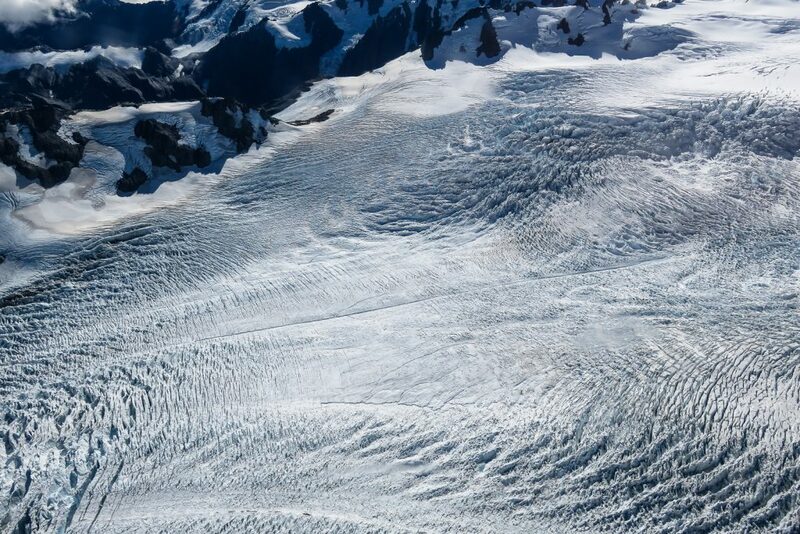 Taking a tour by air is not the only way to appreciate the majesty of these glaciers. A short drive from Franz Josef Town will bring you to a parking lot from which you can walk to the glacier’s terminal face. The walk will take about an hour each way but is definitely worth it. Not only do you have phenomenal view of the glacier, but the journey itself will grant you with a number of picturesque views. On top of the beautiful scenery, the sounds of the glacier are absolutely fascinating. Standing at the terminal face gives you the chance to listen out for White Thunder, the term that is given to the sound made as the ice cracks from it’s continuing flow downhill. This walk is a prime example of why these glaciers should be on your New Zealand South Island Itinerary. 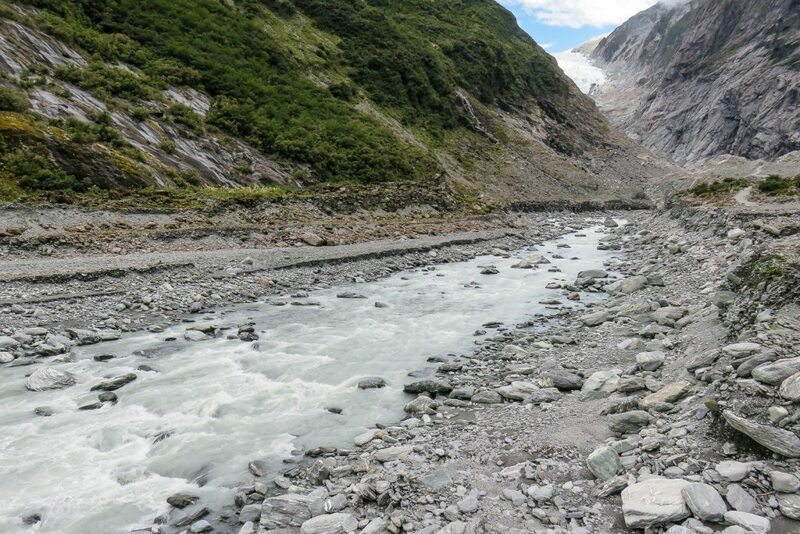 The water that melts from the terminal face of Franz Josef Glacier flows down the mountain to form the Waiho river. The trail to the glacier will bring you alongside this meandering stream of water. 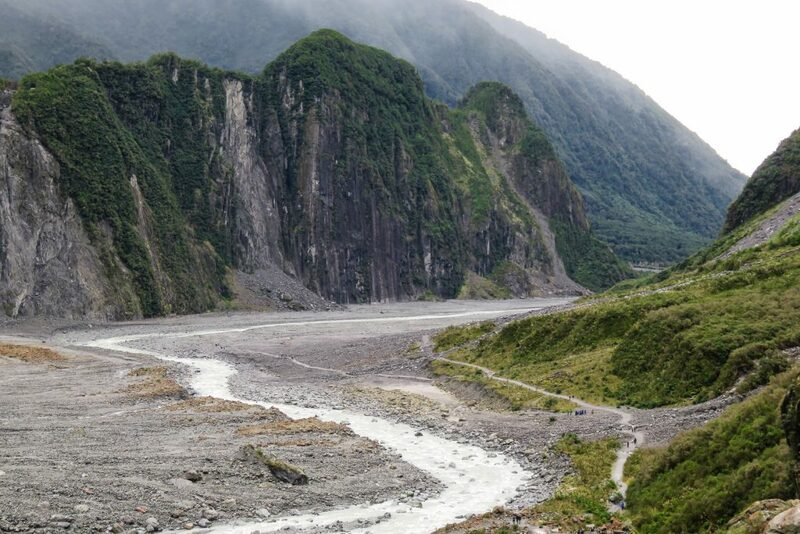 The Fox Glacier walk should be the next stop on your New Zealand South Island itinerary. A little further to the south of the Franz Josef walk, it is far quieter and less busy. 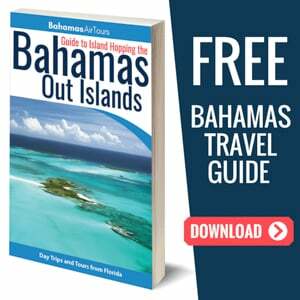 The walk will take 30 minutes each way and should be done in the morning or early evening. The clouds obscure the higher parts of the glacier during midday. Once you reach the glacier’s terminal face you will find that it is spotted with far more rock deposits than its northern neighbour. Though the glacier does display a mesmerising beauty, you will also have the incredible view back down the valley. 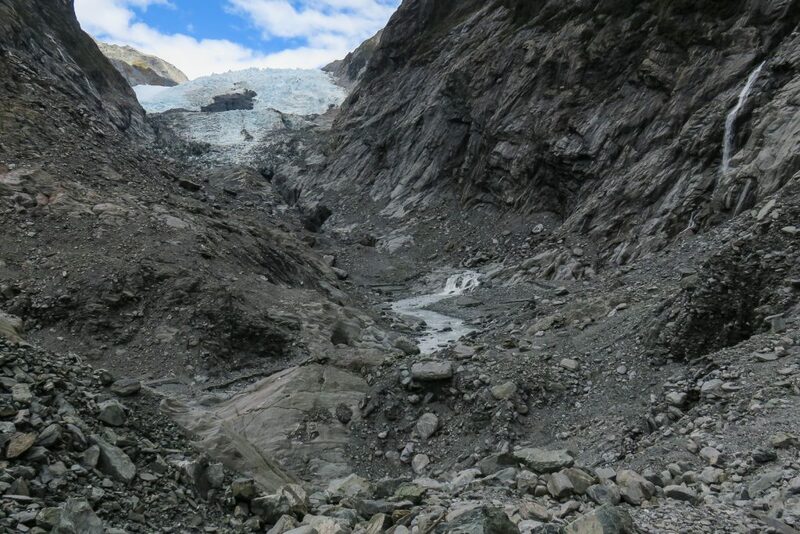 As you look down the ravine you can see the after-effects of the glacier and where it used to lie. New Zealand is a country filled with sites of unparalleled beauty. Exploring these glaciers is just the beginning of a wondrous South Island Road Trip. The magnificence of these glistening ice fields as seen from above is something truly special. Not only do you get a bigger picture of the glacier’s beauty, but it also opens your eyes to the environmental issues that the world is facing. 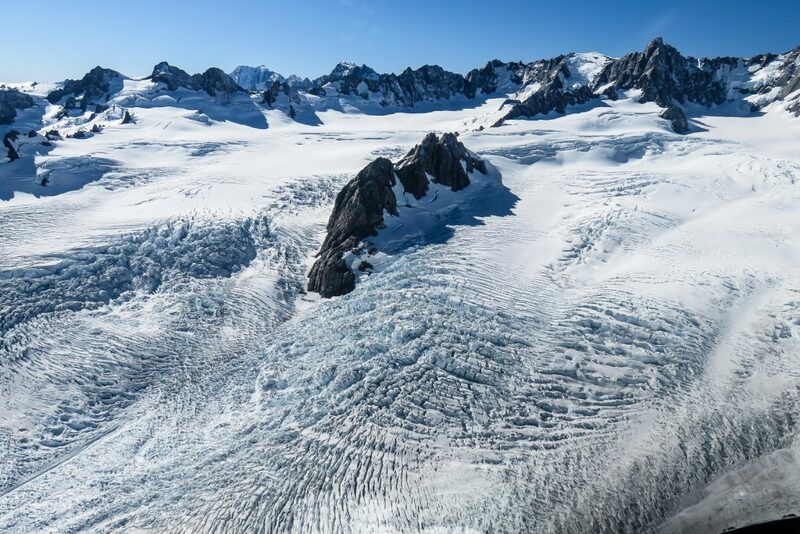 To see the paths that the retracting New Zealand glaciers have left behind is a truly profound indicator of how global warming is directly affecting our planet. 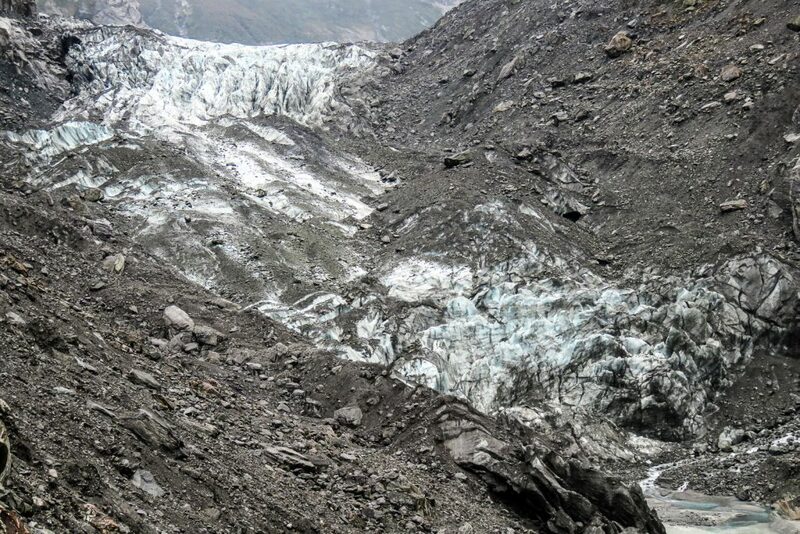 Each and every year these glaciers retreat, and in turn, the world loses a little more of its natural beauty. I hope that in some way I have awoken your wanderlust; Travel is so much more than beautiful sunsets over sparkling oceans. To travel is to know more about the world around you, and to experience what our beautiful planet has to offer. Read more about New Zealand’s spectacular landscapes in our South Island article. 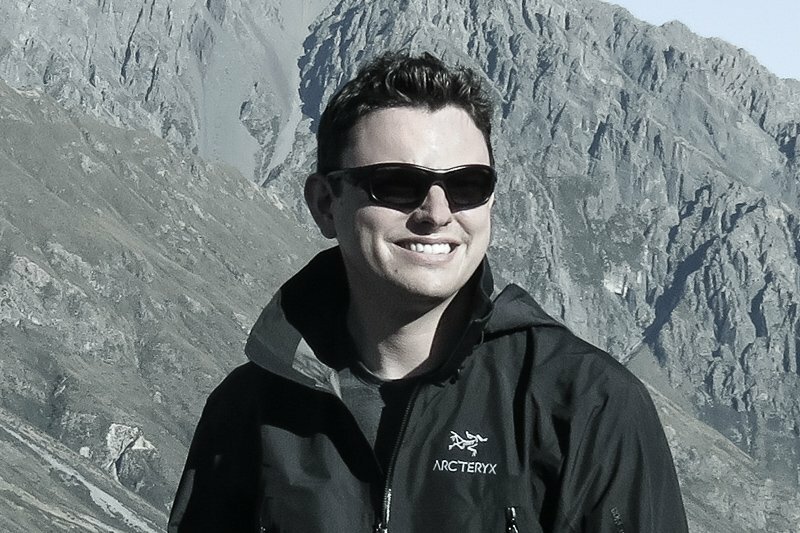 Hi, will you recommend the Glacier if i am travelling with an 16mo infant? If you mean a Glacier hike or climb on the Ice then no, not a good idea! Ive done lots of Ice treks from NZ, Iceland to Argentina. They are quite dangerous, risk of falls etc. If you mean doing the walk to the base of the Glacier along the footpath, then that is fine. It does rain alot in that valley so bear that in mind too!